Lat few days i was stuck with some web dev work for archmage. For the 1st time i had to localize a website in sinhala. Hence i had a longing desire to do something on sinhala i was glad. (Also getting payed for it 🙂 definitely a chance. ) so yeah the site is www.technology.lk still under construction. The site back-end is powered by Joomla CMS and the famous Ecom component virtuemart. I had to prepare a language pack (Sinhala) for virtuemart, not a hard task, yet translating about 200+ words to sinhala is a boring task, so i was googling for an English-Sinhala Translator tool, Found Madura Dictionary. Unfortunately the sinhala words given in madura is not in Unicode. so it was impossible to copy and paste in my language pack php script. After having a chat with my dear friend sanda, he suggested a FireFox plug-in which was developed by the University of Colombo (UCSC) which does a similar task. the plug-in came with a sqlite database which consisted nearly 50,000 English to sinhala translation words, and in Unicode. I was thrilled to see this. 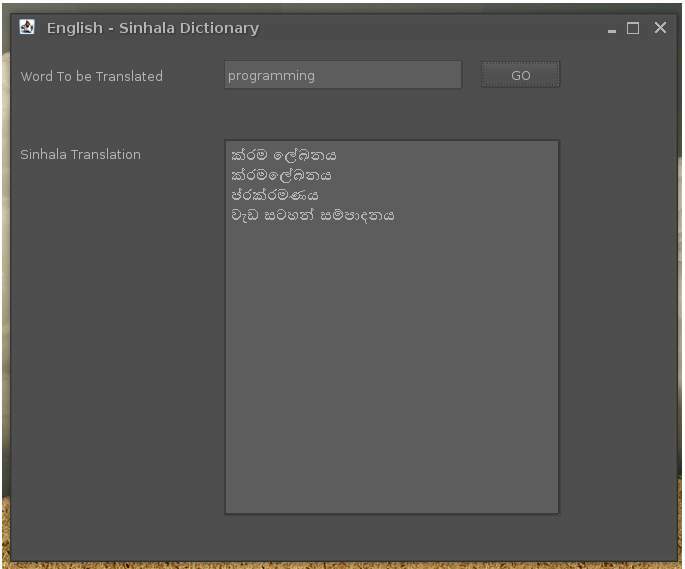 So for my personal satisfaction I just put to gather a small translator tool where you can type an English word and it gives some Sinhala suggestions (in Unicode). this tool and use it, modify it or what ever 🙂 . p.s. : I will publish the Virtuemart Sinhala language pack in my next post.